​Just four miles (or ten minutes) from Baltimore-Washington International (BWI) Thurgood Marshall Airport and the BWI Amtrak® Train Station, MCC offers complimentary shuttle service to and from both locations. MCC is also accessible throughout the Mid-Atlantic region via I-95, MD-295 and I-695. Complimentary parking is available onsite. 1. From BWI Airport: From the airport ramp, take 195 to the Baltimore/Washington Parkway (MD-295 North). Continue to the West Nursery Road exit. At the end of the exit, bear right onto West Nursery Road. Go to the first traffic light and turn left onto Corporate Boulevard. Proceed to the first street and turn left onto Aero Drive. Enter through the gate, turning right onto Maritime Boulevard. 2. From BWI Amtrak® Station: At the light, turn left onto Route 170 (Camp Meade Rd). Continue on Route 170 to I-195. Follow 195 to the Baltimore/Washington Parkway (MD-295 North). Follow MD-295 North to the West Nursery Road exit. At the end of the exit, bear right onto West Nursery Road. Go to the first light and turn left onto Corporate Boulevard. Proceed to the first street and turn left onto Aero Drive. Enter through the gate, turning right onto Maritime Boulevard. 3. From South via the Baltimore/Washington Parkway (MD-295):Go North to the West Nursery Road exit (just after the BWI exit). Bear right at the end of the ramp onto West Nursery Road. Go to the first accessible light and turn left onto Corporate Boulevard. Proceed to the first street and turn left onto Aero Drive. Enter through the gate, turning right onto Maritime Boulevard. 4. From South via I-95: Go North to 195 East. Take 195 East to the Baltimore/Washington Parkway (MD-295 North). Proceed as in number three above. 5. From South via Route 3/301, I-97, Route 2: Go North to MD-100. Go West to Baltimore/Washington Parkway (MD-295 North) and then proceed as in number three above. (Alternative) – Go North to the Baltimore Beltway (695). Take 695 West towards Baltimore/Towson (not the Key Bridge). Take exit 7, Baltimore/Washington Parkway (MD-295 South). Proceed using Southbound directions. 1. From the Baltimore-Washington Parkway (MD-295 South): Go South on the Baltimore/Washington Parkway (MD-295 South) to the West Nursery Road exit (first exit south of 695 Baltimore Beltway). At the end of the ramp, turn left at the light onto West Nursery Road. Turn left onto Corporate Boulevard. Go to the first street and turn left onto Aero Drive. Enter through the gate, turning right onto Maritime Boulevard. 2. From North via I-95 using the Ft. McHenry Tunnel: Head South through the Ft. McHenry Tunnel. Take the third exit after the tunnel, Baltimore/Washington Parkway (MD-295 South). Proceed as in number one above. 3. From North via the Baltimore Beltway (695): From 695 (South), 83, 70 or 95, take the Baltimore Beltway (695 South) towards Glen Burnie. Take exit seven, the Baltimore/Washington Parkway (MD-295 South). Proceed as in number one above. 4. From Downtown Baltimore via I-395: Take 395 South to 95 South. Exit left onto the Baltimore Beltway (695 East). Take exit seven, the Baltimore/Washington Parkway (MD-295 South). Proceed as in number one above. Head northeast on New Ridge Road toward Stoney Run Road. Turn right onto Stoney Run Road. Then turn right onto MD-170N. Merge onto I-195W. Take exit 2A fro MD-295N. And take the W. Nursery Road exit. From W. Nursery Road, turn left onto Corporate Boulevard, then left onto Aero Drive. Enter through the gate, turning right onto Maritime Boulevard. 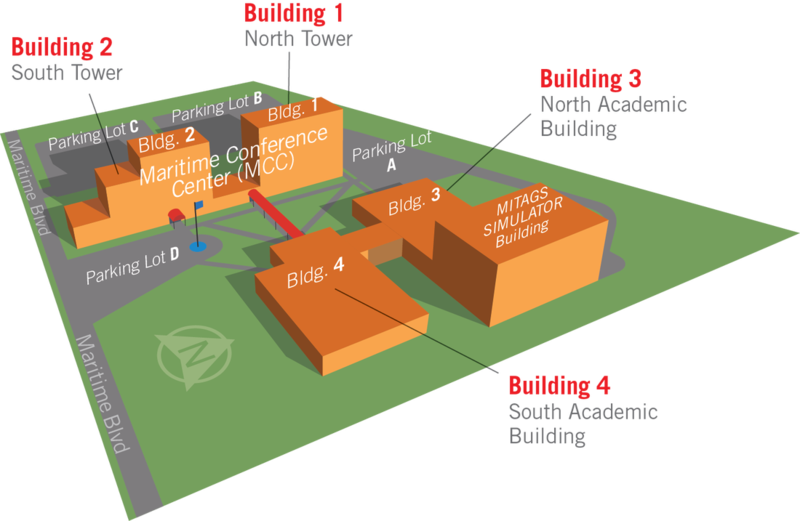 ​Once on Maritime Boulevard, follow the blue lines to visitor parking lots A, B, C or D. After parking, please visit the front desk, which is located in the South Tower (Building # 2), for directions to your specific meeting room. ​For additional information on directions, please contact the front desk at (410) 859-5700, extension 0. Building #1 – North Tower: This building includes Meeting Rooms 2 through 8 North. We suggest you park in Lots C or D.
Building #2 – South Tower: This building includes the main lobby, Chesapeake Dining Room, front desk, Meeting Rooms 2 through 7 South, and Deckrooms A and B. We suggest you park in Lots C and D.
​Building #3 – North Academic Building: This building includes Classrooms 1, 2 and 3, Rooms A-300 to A-315, the Auditorium and the Bridge Room. We suggest you park in Lot A. Building #4 – South Academic Building: This building includes Rooms A-111 to A-129, the administration offices and the Computer Lab. We suggest you park in Lot D.
Select Penn Line for destinations from BWI Airport. MARC Train Service is a commuter rail system, whose service areas include: Harford County, Maryland; Baltimore City; Washington D.C.; Brunswick, Maryland; Frederick, Maryland and Martinsburg, West Virginia.